In 1984, John R. Lawson II spotted a distinctive piece of mail at the office. He knew that the onion-skin envelope — used at that time to reduce the cost of air mail — contained a British company’s letter of intent to buy Newport News-based W.M. Jordan Co., the construction firm Lawson’s father, Robert, and William Jordan founded in 1958. The purchase price already had been set, and employees had been informed of the pending deal. John Lawson quickly locked the envelope in his desk drawer. “I knew once Mr. Jordan signed the letter of intent, the deal was done,” he recalled 34 years later. The construction company was for sale because Jordan was ready to retire. John Lawson, however, had misgivings about the fate of the Virginia firm as part of a larger, foreign company. The final step was to persuade his dad. Lawson was nervous. The British deal meant financial security for the rest of his father’s life. By buying the firm, on the other hand, the Lawsons could risk everything. He laid out the plan for the Lawsons and a business partner, Nat Macon, to purchase the company from Jordan for the same price offered by the British firm. His dad didn’t hesitate. He was in. In fact, he never really wanted to sell. Lawson’s prediction about the company’s future was spot on. Within a year, the firm had made back the purchase price. It continued to grow rapidly and today is known for its work on iconic projects in Virginia and North Carolina. Lawson, now executive chairman, says the company has never had an unprofitable year. W.M. Jordan employs more than 300 people at offices in Newport News, Richmond and Wilmington, N.C., and has annual revenues of $500 million. 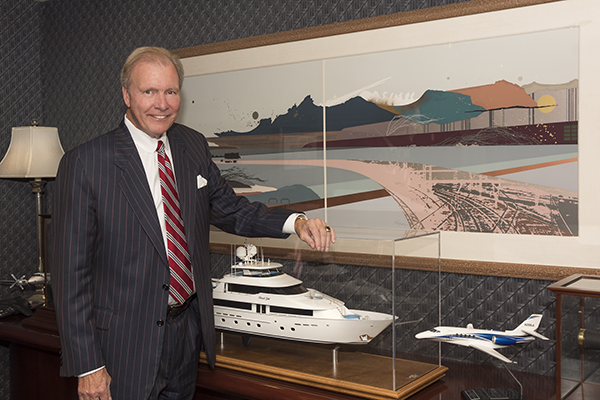 Because of his business success, community influence and longtime philanthropic efforts, Virginia Business has named Lawson its 2018 Business Person of the Year. Lawson, 67, and his dad worked together at the company for more than 40 years. Robert Lawson retired from the company in 2013 but remained executive chairman until just before his death earlier this year at age 91. That business relationship almost didn’t happen. Before graduating from Virginia Tech with a degree in geophysics in 1975, John Lawson received an offer for a high-paying job at Atlantic Richfield Oil Co. in Dallas. But he wanted to return to Newport News where his family had lived for generations. Lawson asked his dad if he could work at the construction firm. “I told him: ‘I think I could learn to like construction. I just know I don’t want to leave the area. I’ve got everything that is important to me here,’” says Lawson. His father could only pay one-third of what the oil company offered, but that was fine with Lawson, who initially lived at home. On his first day on the job, he collected trash from company work sites. He soon was on a surveying crew, handling the engineering for the layout of new buildings. Lawson quickly moved through several positions, including assistant superintendent and superintendent on job sites. After he nearly fell down a 10-story elevator shaft, he tried his hand at office jobs. That’s where Lawson found he had talent for the business side, serving as an estimator and project manager. Soon, his responsibilities swelled. A little over a year after the 1985 buyout, he was named CEO at age 34. The firm’s Newport News headquarters includes two simple buildings on busy Jefferson Avenue. The property abuts a Family Dollar store and a Newport News police precinct. “We’re not flashy here,” says Lawson. But many of the firm’s projects can be described that way. At any given time, the company has 50 projects underway worth an average of $50 million. Given the firm’s 60-year history and diverse portfolio of projects, Lawson finds it hard to single out favorites. Lawson is an owner of the hotel with Bruce Thompson of Gold Key|PHR Resorts, a partner on many projects, and other investors. W.M. Jordan Co. served as general contractor in the restoration. The $85 million project recently was recognized by ENR Mid-Atlantic for the work required to restore the hotel while preserving its historic features. Another project that includes Thompson, The Main Hotel in Norfolk, also stands out. The team traveled the country to gather ideas for details found throughout the hotel, which has become a landmark meeting destination. Other standouts? Buildings on probably 20 colleges, including many at Christopher Newport University in Newport News and Virginia Tech. Health-care projects include Children’s Hospital of the King’s Daughters in Norfolk and the 16-story Critical Care Tower at Virginia Commonwealth University. A history buff, museum projects also are a highlight for Lawson. Memorable jobs have included the Virginia Aquarium in Virginia Beach, Mariners’ Museum in Norfolk, Virginia Living Museum in Newport News and Maymont in Richmond. An ongoing endeavor for Lawson is Tech Center, a mixed-use development he envisions growing into a research and innovation hub in his hometown. Lawson saw the opportunity in 142 acres he owns at the busy intersection of Jefferson Avenue and Oyster Point Road. The property is adjacent to the Thomas Jefferson National Accelerator Facility, commonly known as Jefferson Lab. Inspired by the success of the Virginia Tech Corporate Research Center in Blacksburg, Lawson envisioned a community that attracts researchers from around the world. He pitched the idea to former Virginia Tech President Charles Steger. Tech agreed to manage the Tech Center Research Park. Plans call for 1 million square feet of research space. Lawson started with the amenities. He’s already invested $250 million in the mixed-use project, which includes 250,000 square feet of retail space, called Marketplace at Tech Center, and the 288-unit Venture Apartments. The first research building, scheduled to open in February, will be fully occupied by startup and early-stage companies. Discussions are ongoing with an anchor tenant for the second research building. Lawson hopes the development will give the Jefferson Lab a boost in competing with Brookhaven National Laboratory on Long Island for a $1 billion electron ion collider. The Nuclear Science Advisory Committee decision could take several years. The collider, a major development in physics research, is expected to have a $4 billion economic impact wherever it goes. Lawson has invested in more than bricks and mortar. Reflecting on his tenure as CEO, he mentions the company’s employees first. Lawson led a paradigm shift in company culture in the early 1990s. “I didn’t think we were performing to our maximum capacity from a quality or schedule standpoint or a production standpoint,” he says. He also started an internship program that has bred many of the company’s leaders. In fact, about 40 of its top managers started as interns. Last summer, the company had 28 interns from 10 universities. Over the years, Lawson has added various amenities to attract and retain employees. He founded a learning and development center. In addition to professional development, it offers assistance in areas such as personal finance. Lawson also emphasizes wellness and nutrition. He turned a former Newport News bank branch into a gym that offers yoga, Zumba and other fitness classes. Lawson himself works out an hour there each day with a personal trainer. The company employs a full-time wellness director and a decade ago built an organic garden. Throughout the year, the company grows vegetables and fruits that employees can take home for free. Excess produce is donated to a local food bank. “With our culture John has created, everyone really respects and admires him and just cannot wait for his next idea,” says Ronald J. Lauster Jr. 48, president of W.M. Jordan Co. “It’s really inspiring to have somebody around you that is always challenging you to be better. John has such a hunger for constant learning and continuous self-improvement”. Lawson’s employee focus is evident in his succession planning. He spent the past two years working with a consultant on identifying six employees for top management. They were sent to leadership development programs at places like Harvard and Stanford. A slate of new leaders was announced in August, with Lauster named president. He has worked for W.M. Jordan since 1997, managing high-profile projects such as The Cavalier’s restoration and construction of the Ferguson Center for the Arts at Christopher Newport University. Lawson became executive chairman in this transition, focusing on the company’s culture and its development business. The new role also allows him more time for philanthropic efforts. He sits on 15 community, civic and nonprofit boards, including the Children’s Hospital of the King’s Daughters, Hampton Roads Community Foundation, Reinvent Hampton Roads, TowneBank, Mariners’ Museum and Myers-Lawson School of Construction at Virginia Tech. The construction school was founded a decade ago with a $10 million gift from Lawson and A. Ross Myers, a former fraternity brother. The school is currently expanding. A former Virginia Tech rector, Lawson co-chaired a $1.1 billion fundraising campaign for the university. He also led a $66 million fundraising campaign for CNU and is leading a campaign to create a behavioral health center at Children’s Hospital of the King’s Daughters, a facility his company will build. His generosity is not just financial. Lawson’s family had known former NFL quarterback Michael Vick, a Newport News native, since he was a star player at Virginia Tech. After Vick was released from prison after dog fighting convictions, he needed a job to serve his parole. At 67, Lawson doesn’t show any sign of slowing down. Despite his full schedule, he sets aside time for himself and his family, including sailing a 130-foot boat he had built in Seattle. He also continues to focus on developing the next generation of company leadership, creating leaders who he calls clever and decisive. Those are the same characteristics that helped him hide that letter all those years ago.